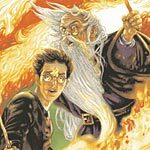 Many of you have written to us regarding the Web site for James Potter and the Hall of Elder’s Crossing, which looks remarkably similar to an official Harry Potter Web site that might be put out by Warner Bros. As earlier reported, the site heralds a fanfic written by George Lippert, a 37-year-old Web designer from St. Louis, MO, who wrote the book-length fic for his wife and children and plans to release a chapter a day in December. Some papers, including The Scotsman, have reported that J.K. Rowling’s representatives are threatening legal action against Mr. Lippert. This is entirely false, and some papers have retracted that information publicly. Again, the Christopher Little Agency also told TLC of the phone call, its contents, the requested provisions regarding the work, and the request to share the fanfiction with J.K. Rowling (though whether it has indeed gone to J.K. Rowling herself is unconfirmed). Mr. Lippert has said that he’s quite surprised by all the attention to his work and didn’t intend for the story to become so egregious.